Crédit Agricole, HSCB and JPMorgan have been accused by the European Commission of euro rate rigging, i.e. colluding to fix Euribor, a key euro benchmark borrowing rate. The Commission also says it will charge ICAP, a broker, with suspected manipulation of the yen Libor rate. So far, European and US regulators have fined a total of 10 banks and brokerages about $6 billion for rigging the London interbank offered rate (Libor) and Euribor, its euro cousin. Sixteen individuals have been charge with fraud-related offenses. 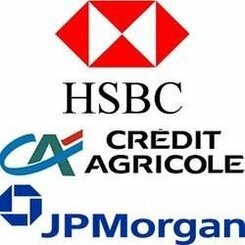 While Crédit Agricole says it will study the Commission’s findings, HSBC and America’s largest bank JPMorgan say they will fight them. The three multinational banks face penalties representing up to 10% of revenue. Unannounced inspections were carried out by the Commission at the premises of a number of banks in 2011. During the course of its investigation, the Commission imposed fines to the tune of €1.04 billion on four banks active in the same sector in December 2013. The three banks could have settled in December 2013. As they didn’t, the Commission says there will be no penalty reduction. The four banks, Barclays, Deutsche Bank, RBS and Societe Generale, admitted their involvement in a cartel relating to euro rate fixing. Barclays was not fined because it had notified the Commission of the cartel’s existence, while the other three were granted a 10% fine reduction for agreeing to a settlement. As Crédit Agricole, HSBC and JPMorgan refused to settle last December, like the other four banks did, no reduction in penalties will be offered, competition commissioner Joaquin Almunia said. A Statement of Objections is a formal step in European Commission investigations into possible violations of European Union rules on restrictive business practices. The Commission must inform the parties concerned in writing regarding the objections raised against them. The companies can examine the documents in the Commission’s investigations file, reply in writing and ask for an oral hearing to present their comments before Commission representatives as well as representatives of national competition authorities.